Robin has been hinting that she’d like a full size refrigerator for some time (we’ve been living out of a dorm fridge for 2 years now). At first I tried to convince her of a few alternative solutions, but she finally hit me with one of those I’m-living-in-a-house-with-no-walls-and-no-wiring-lit-by-shop-lights-and-heated-by-a-woodstove-and-now-you-don’t-even-want-me-to-have-a-normal-fridge looks, and I relented. Domestic harmony is worth much more than a new refrigerator, and Robin is always very long suffering of my many projects and our rustic living conditions. Anyway, as with most purchases, I embarked on a lot of research before selecting what we were going to buy. I’ll admit I’m a little OCD on the pre-purchase research. Perhaps it’s the engineer in me. I generally buy things new and keep them forever, so I want to make sure I’m getting the best product available at a given price. From flashlights to power tools, and from knives to drip irrigation, I read comments on product websites, join forums devoted to enthusiasts, and watch YouTube reviews. Anyway, I thought I’d share my fridge research results, written from a homesteading standpoint, as it might prove useful to someone else. Refrigeration options are presented from most efficient to least efficient. My definition of “efficiency” will most likely differ from yours. For the sake of this post, efficiency is: “minimizes the cost to purchase, operator, and maintain”. 2nd Place: Passive Refrigeration – Most people are familiar with the root cellars of the early American pioneers. These were passively cooled high-humidity food storage structures. We once talked about building a root cellar here (an earth bag dome actually), but the reality is that Oregon’s moderate winter temperatures make it largely unnecessary. Storing food in the outbuilding which will house our well pressure tank should provide a temperature moderated space. For indoor passive cooling, an icebox is your best bet. An icebox might sound hopelessly antiquated, but a modern version could use high R-value foam and gaskets to be extremely well insulated. If you have a chest freezer like us, then frozen one gallon water jugs would provide a convenient source of ice. I like the fact that an ice box can look like a piece of furniture instead of a big metal appliance. Other options for passive cooling include the cold pantry (built over a stream or earth buffered) and the Coolgardie safe (an evaporative cooler). Passive cooling systems generally have no moving parts, can be built from readily available materials, have low operating costs, but require regular interaction to maintain. The icebox would provide the most consistently cool temperatures, but relies on a working freezer (small chest freezers are cheap though). 3rd Place: Converted Freezer – Freezers are cheaper to buy than refrigerators, better insulated, and cool more quickly. The next most efficient method of refrigeration is to buy a freezer and convert it to a refrigerator. For some upright models, this is as simple as flipping a switch. For a much more efficient refrigerator, you can buy a chest freezer and convert it with a simple control circuit. The resulting chest refrigerator is about 10x more efficient than an equivalently sized modern upright fridge. (Less than $5 a year operating costs.) I was a big fan of this option, but Robin held out on the negatives: a chest fridge would take up more floor space and much of the space is hard to access. True. Effective use would require some form of pop-up racks like the fridge in William Lishman’s house. 4th Place: Used Refrigerator – A good deal on an older model refrigerator seems like the perfect homestead solution, but not so fast! Refrigerators of 30 years ago were built like tanks and many are still running today, but their operating costs can be very high. Even 10 year old refrigerators (the ones that haven’t quite worn out yet) can cost twice as much to operate as a new fridge. Ultimately, a bare-bones new fridge and that cheap used one are likely to cost about the same (when averaged over their lifespan). The other concern with a used fridge is that you may be buying someone else’s lemon, and repairs can be expensive. 5th Place: New Refrigerator – It’s certainly the most convenient, but buying a new refrigerator is probably the least efficient option. All the various brands of refrigerators are made by only 3 or 4 companies, and they know that you won’t buy a new one until your last one wears out. As result, most refrigerators built during the last 20 years are pretty much disposable. You can check Consumer Reports and read reviews online .. I did until my eyes watered .. but every brand has it’s share of horror stories, and historical reliability is almost meaningless since companies regularly change suppliers and move their manufacturing sites to save money. My best advice is to pick something by the current reliability leaders (Whirlpool and Samsung at the moment) and hope for the best. Extended warranties won’t help — they expire before the problems usually start. Once you’ve selected a brand, you now have to sort through a pile of different models with varying features. The cheapest fridge models have a top freezer (starting at $750). This is a classic design and the most reliable, but it hasn’t become any more convenient over the years. Putting the more useful part (the refrigerator) on the top adds about $250. If you can’t choose between or left or right swing and would like double doors on the top add another $400. If you don’t like opening the door for ice and would like a dispense add $500. (Also expect this feature to break first.) If neither white nor black matches your decor, you can have stainless steel for another $200. All prices are based on similarly sized Whirlpool models at a local big-box store. You might think that you can save money by picking a smaller model, but expect the quality to go down considerably. Our review of several brands suggested that the smaller volume, the more fragile the drawers and shelves. There is one exception: counter top depth models give you smaller volume but with nice hardware. For this privilege add $1000. So, those are the options we considered. We philosophized about refrigerator-free living. We talked about iceboxes. Okay, I talked about iceboxes and Robin raised an eyebrow in a disapproving manner. I enthused about freezer conversion, and the eyebrow become more disapproving. I briefly considered a used model, but lemon risk turned me off. And ultimately, that’s how we ended up with the 5th option — the least efficient. In fact, it’s worst than that. We didn’t just buy a new one, we bought a huge 25 cu.ft. fridge-on-the-top split door stainless elephant. Why would we do such a thing? Well, it was on sale with a good warranty, few likely-to-break features, much nicer hardware than the human sized model (19 cu.ft.) … but ultimately, when your house doesn’t have a light switch, a refrigerator that doesn’t require stooping is living the high life. What a great comparison on refrigerators and cooling options! I’m glad you guys got a nice one! You deserve it so much! And a 25 cu ft one – wow!!! No more wilted celery and peppers, no more melted butter! What brand did you buy? 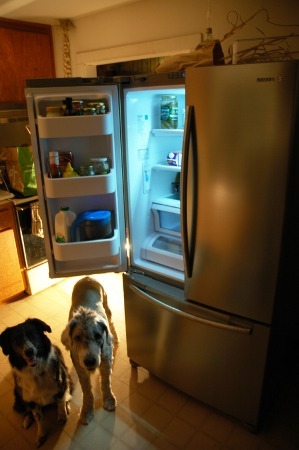 The doggies look like they are waiting for some goodies to come from the new fridge! Refrigerators have been on my mind lately – The fridge in our rental house has recently stopped working, so we have it in the shop now for repairs. Plus my office is looking to buy a fridge, so I’ve been starting to look around at them. I’ve looked at used ones, but decided we didn’t need someone else’s lemon, and have decided on new. But I don’t want anything all that fancy for the office! i am just about to buy a freezer to hold the carcass of the pigs we are about to buy! we are getting a chest freezer!!! You rock, Lee, I’m exactly the same way. In fact, in my head I’ve done much the same evaluation in the fridge dept. When we hatched this crazy notion to move 600 miles to a patch of woods and build a house ourselves, I ended up buying a fridge for nine bucks, sitting out in the rain with the doors off. The kids in the building dept. said there was no way to test it but I could return if it didn’t work. I couldn’t do it at first. I left. Finally, I couldn’t say no, so I went back and bought the ugly thing. “Just while we live in the pole barn,” I told Mel. Surprise, it actually worked pretty good. Sometimes the trade-off is convenience and HAPPINESS! Robin, enjoy every minute of your new fridge! Lynn – Yeah, it’s a huge one. The 19 cu.ft. size would have been much better suited to our space (about 2-3 inches smaller in both directions), but unfortunately I had my doubts that the shelves would support a couple gallon milk jugs. Sadly it’s true – we haven’t had celery in about a year. By the time we try to use it, it is invariably dissolving on the counter. I don’t envy you your up-coming fridge shopping. I’d love to not look at them again for 20 years. John – I love our chest freezer, and it was an easy purchase for me. Walked into the store .. “I’ll take that one.” There’s not many models or options for a specific size. Ron – Yeah, this post has been jelling in my head for too long. It was trial to leave out all the odd asides I’ve come across. I hardly think you can go wrong with a working fridge for $9. You might be able to borrow a KillAWatt meter from your local electric company to find out exactly how much power it is costing you, but I doubt it’s a bad deal any way you run the numbers. I wish I was as daring as you with buying used products. We do end up buying most things new, although there are a few things I’m determined to find used. Tractor implements come to mind. Ali – Yes, the happiness factor is definitely pretty high. My mother-in-law has an upright fridge/freezer and they really like it, but it’s pretty short on convenient storage. I think theirs is filled entirely with metal wire bins. I don’t understand how companies use cheap plastic interior parts to justify high prices. Charity – I’m already getting used to the upright-fridge checking. It’s pretty nice. And yes, it was the infamous eyebrow of incredulity. I’m in the same boat as Ali. Our fridge is reaching the “designed obsolescence” threshold. I always look at the new stuff and wonder if they’re worth a crap. Thanks for doing the comparison/research. Case 1.) “Ack! I just bought a new fridge and it broke in a month! This brand stinks!” i.e. Quality control problems. Case 2.) “I just bought a new fridge, I’ve had it a month and it’s awesome!” i.e. New purchase high. Case 3.) “I’ve had this fridge 5-10 years and it just died. I’m going to buy brand X next time!” i.e. Design reliability problems + delusional brand switching. Maybe it’s a flaw in capitalism .. that price competition ultimately leads to lower quality .. but I believe that the only common household product that has actually improved in the last 40 years are automobiles. (Less maintenance required, longer lived, much safer.) Most other products have gone down in price (inflation adjusted), but they’ve declined in quality much more rapidly. In the house I grew up in, we had mostly Kenmore appliances. All of them lasted 25-30 years, with only a few easy to fix part changes. My mom repainted the fridge from avocado to egg-shell about 5 years before I left home, and when she sold the house a couple years ago it was still going strong. By comparison: in the last year Sears (now a subsidiary of K-Mart) dropped the last of their Whirlpool contracts and will now be selling only LG refrigerators with the Kenmore label. Consumer reports rated LG worst in reliability across a number of different kitchen appliance categories. Hello? (knock, knock) Anyone home? I did justify the purchase with the knowledge of her doing without a new refrigerator for 18 years. Hopefully this one (it’s just like yours but ours is Samsung – not sure what yours is) will last at least that long. Hey Steve, I’ll admit we do enjoy the new fridge, and it’s hard to fault spending money on something you use so often each day. Ours is also Samsung. They seemed to have a slight edge in reliability at the moment, newer technology (LED lighting and dual evaporators), better warranty, and no premium for the stainless steel finish. I still wish it was smaller, more of a European-style model, but small+quality seems to be a combination not generally available in the U.S. So, I know that this post is super old, but I’ve been reading through the archives and let me just say, I absolutely love your blog! This whole project sounds like something my husband and I would LOVE to do, crazy or not. However, I think it’s funny that one of the comments said that “girls can’t live without their refrigerators.” I’m the one trying to convince my husband to go with an icebox or a converted chest fridge instead of a conventional refrigerator. I think a converted chest freezer for a fridge sounds amazing; he, like Robin, argues that it would be terribly inconvenient. Oh well. Thanks for the reminder that refrigerator addiction is not gender specific! We do like our fridge, and it has survived 2.5 years without anything breaking so I guess that is good. I still wish is was smaller. The back 6″ of each shelf is a wasteland of forgotten items and empty space. Reading through the archives is a pretty big endeavor at this point. I’m impressed! We haven’t been as active recently (for reasons soon to be posted), but we still have lots of projects in flight and we hope to really commit to more house progress this summer. I really appreciate this I info. I think I would actually go with the ice box option, and large freezer. It makes sense when your getting meat in waves and making cheese in batches. Milk is really the only thing I see needing to be refrigerated.